7nbsp; The roofs of houses in western Lemkivshchyna were made of wooden shingles because the land was rich in forests. The best material for making shingles was Carpathian silver fir (sometimes 60-80 year old spruces were used), which preferred to grow within secluded thickets.A worker producing shingles ("gonty") was called a "gontiar", and his profession was not complicated. 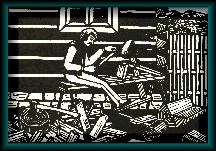 For tools all he needed was a sharp "wedge" ax, a mallet ("kiyan"), draw knife, grooving tool ("pazhak"), and a simple workbench*. During the summer some master craftsmen made shingles right on the spot where the tree was felled, but more often the log was transported to their house, where it was sawed into planks about 60 centimeters in length. From each single plank("klotsok") one obtained from thirty to sixty chipped and wedged boards, which then had to be smoothed with a two-handle knife, this was followed with cutting out of small grooves with a plane, into which the adjoining shingle hooked in with its own protruding edge. The width of one shingle ranged from 8 to 15 centimeters. An expert craftsman could produce about sixty shingles in a day, which was sufficient to cover a two square meter area of the roof. In such villages as Chertizhneh, Bilichna, Kotiv, Kamianka and Bilianka, the production of shingles became more of an industry, they were sold on the job site or at fairs (singular - "yarmak") either in the town of Horlitsee or in Hrybiv. Roofs covered with shingles lasted, on the average, from twenty to thirty years. Some home-owners preserved shingles with crude oil (diesel), thus adding years to the life span of the roof. * The workbench was equipped with a peddle, which operated "holovach" (the "head"). When the peddle was depressed with a foot, which in turn lowered or lifted the "holovach" to hold a shingle in place or to release it. The entire bench is commonly referred to as "dzee-ad" or a "poor beggar".